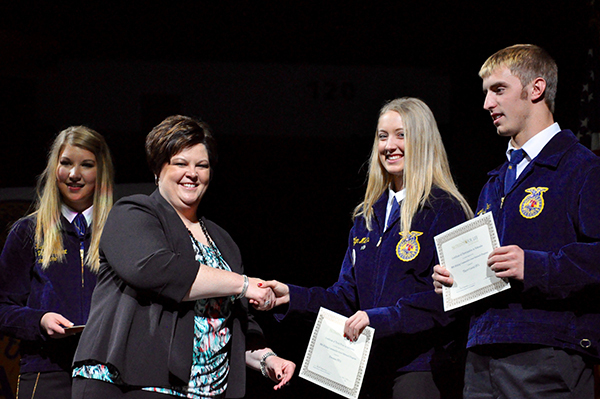 There were many outstanding applications in our Helping Communities Grow program with 100 total participating FFA chapters across 17 states reaching over 600,000 community members. 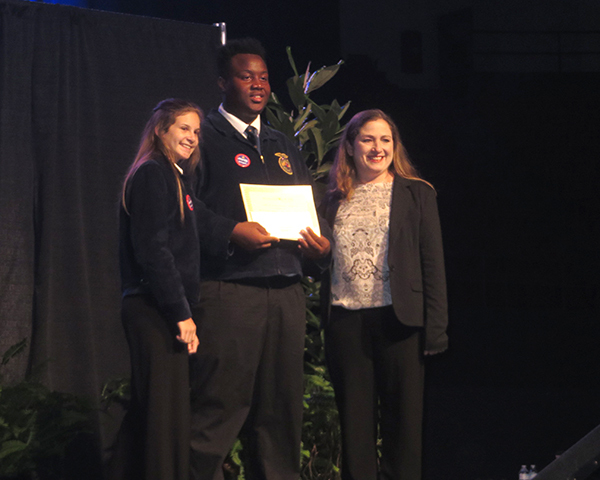 The program challenged FFA chapters to investigate and discover the critical role fertilizer plays in improving plant health for an abundant, affordable, and safe food supply. With this gained knowledge, they were to go beyond the classroom and educate their community on the benefits fertilizer and soil nutrients play in food production. The FFA students carried out experiments with their 30×10 garden area with different types of fertilizer such as manure from the fair and fish fertilizer. Students saw firsthand the positive effects of fertilizer on growing lettuce. They also hosted Ag Day and Young Aggie Boot Camp reaching over 700 elementary student and 100 middle school students with soil nutrient hands-on activities. A comparison of human nutritional needs, livestock nutritional needs, and plant nutritional needs were featured in the FFA chapter’s literacy activities, which included a farm day, ag day, and elementary school presentations. Members created a 10′ x 10′ landscape garden exhibit at the county fair with emphasis on the importance of planting Mediterranean climate plants in healthy soil. Students took a field trip to the local landfill to see how plant material from green waste was converted into compost for community use. They also visited six nurseries in two days where they learned about plant growth, plant nutrition, and viewed different types of soils. As a result of their many activities, they learned that happy plants make happy food. 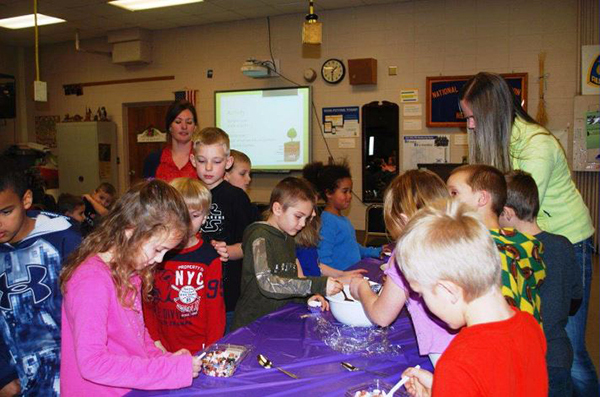 FFA members taught elementary students about essential plant nutrients and fertilizer. Fresh produce from the schools garden was donated to the Culinary Arts program where students learned how to prepare fresh from Florida vegetables such as lettuce, tomatoes, chives, and eggplant. The horticulture classes built small raised beds for two of our ESE classes so they could understand garden and learn about soil fertility. 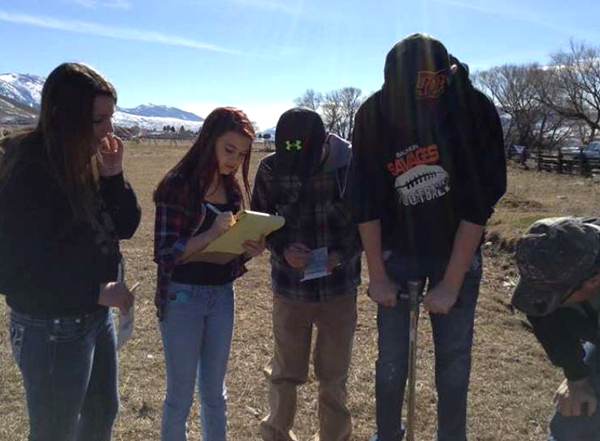 The FFA members created strategies for testing nitrates in a local river. Their map of nitrate loss was posted at a local coffee shop, and the results will be shared with farmers in the fall. They also distributed 45 informational flyers to local ag businesses, restaurants, and gas stations that showed the 2016 test results. The chapter also received recognition in a local newspaper. Other community outreach involved educating Chicago third graders, where they did soil pudding with sprinkle fertilizer and soil sammies. They also created a YouTube video song parody. The FFA chapter harvested produce from their 250 plant system for the school lunch program, educated 1,400 students on aeroponic principles, and develop a video which high school agriculture classes statewide could utilize to learn about aeroponic principles as well as nitrogen, phosphorus, and potassium. FFA members created a dome shaped fiberglass aeroponic system and planted a test plot to compare normally grown garden produce with aeroponically grown produce. 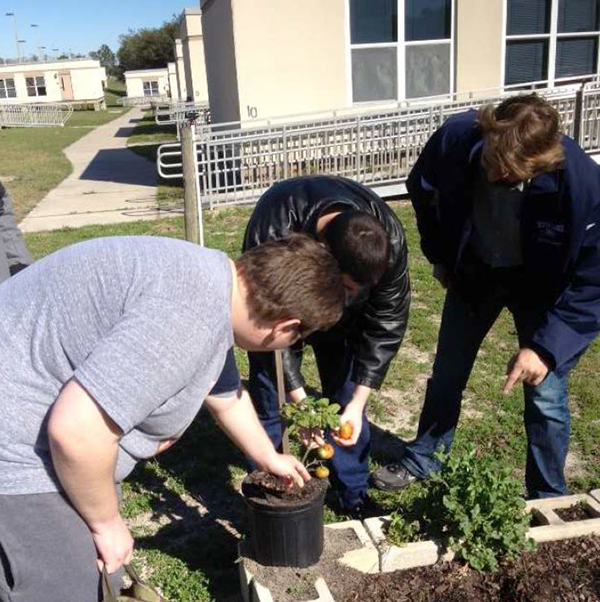 The horticulture class learned that students at Mission Valley were not aware of the connection between nourishment of plants and the nourishment of our bodies. In an effort to change this perception, the students developed a museum centered on a key Kansas commodity, wheat. Using this commodity as a focus in a “Wheat”seum, students connected with the agriculture and learned about the nutrients that go inside of certain fertilizers and what they do to help fertilize wheat. FFA members built a large hydroponic system. Each layer had a different crop in it. The food was donated to the needy at the local St. Vincent DePaul. 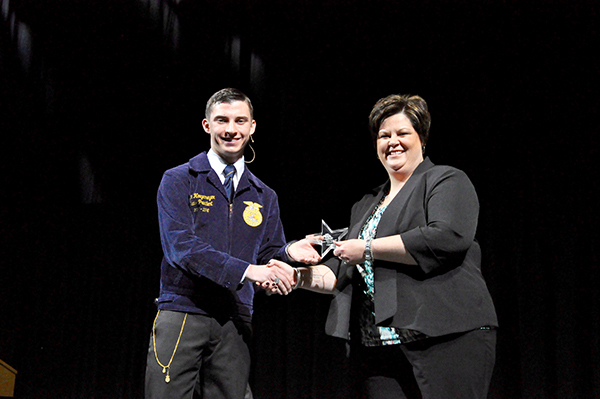 They also used the system for ag days to teach 1,600 students. Students and campers were able to see the value of plant nutrients and what happens with deficiencies and disease. 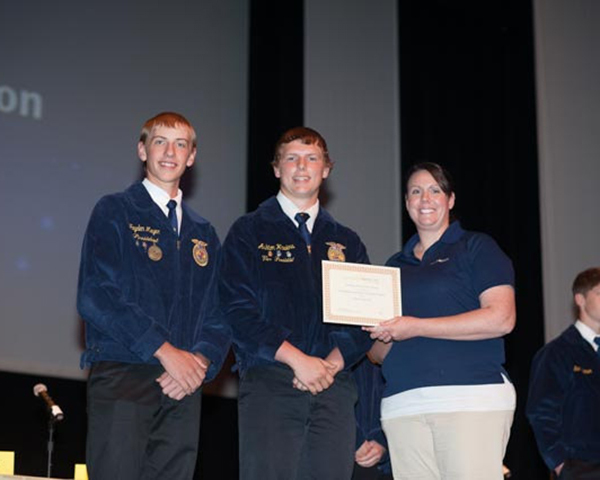 The Lewiston FFA Chapter created a pre-show promotional screen shot that was played at the Marysville Movie Theater for several months. Movie goers viewed the shot that showcased healthy soils and the importance of fertilizers in feeding a growing population. They also hosted a member/guest Agribusiness Tour with visits to area businesses that have expertise in fertilizer and soils. In addition, the chapter conducted educational presentations with the fifth grade elementary students and produced promotional videos for the Nutrients for Life Foundation to post on their social media sites. 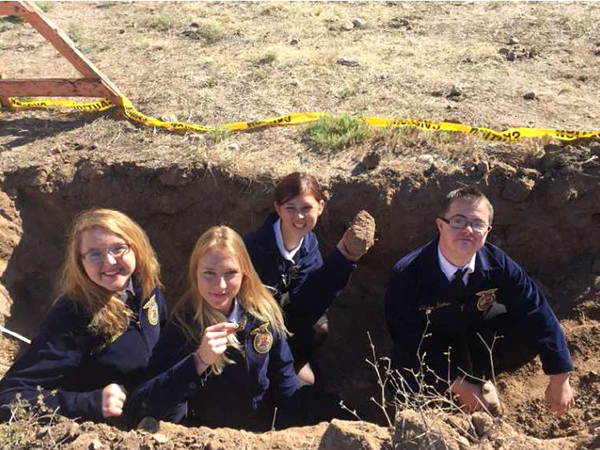 FFA members gave back to the community by hosting a water and soil fair where community members brought in soil samples, had them tested, and the FFA members shared results and recommendations. Participants shared they had never had their soil tested and the majority admitted that they simply added soil nutrients to their garden because they “thought it was the right thing to do” but admitted they were probably not apply correct amounts of fertilizers. The FFA members involved in this educational outreach activity might not be professional agronomics but they will always be consumers of agricultural products and lifelong advocates for benefits of fertilizers and soil nutrient management techniques. They could easily serve as spokespersons for the benefits of fertilizers and soil nutrients. The FFA hosted an elementary agricultural experience day. Classes came in three, one hour increments with K-2, 3-4 and 5-6. Rotations included an edible soil horizon, potassium cycle activity that featured the Nutrients for Life Potash Mining video, an activity with local agronomist, and a bracelet that featured the three most critical nutrients, nitrogen, phosphorus, and potassium. The New Auburn incorporated Nutrients for Life messaging in a multitude of classroom and community events, with each event being creative and unique. Their promotions were visible at the county fairgrounds, in the middle of a parade, in a meeting at the Alpha Tau Alpha Fraternity at the University of Wisconsin -River Falls, in elementary classrooms, in the school hallways, and through articles in the school newsletter and the local newspaper. Their activities utilized a booth with the theme: “Row by Row is How We Grow with N, P, K” and an activity where FFA members wrote about NITRO’S GARDEN ADVENTURES. This activity promoted the benefits of fertilizer and soil nutrients through a children’s book written for second grade students with added illustrations. Congratulations to all of the chapters who participated! 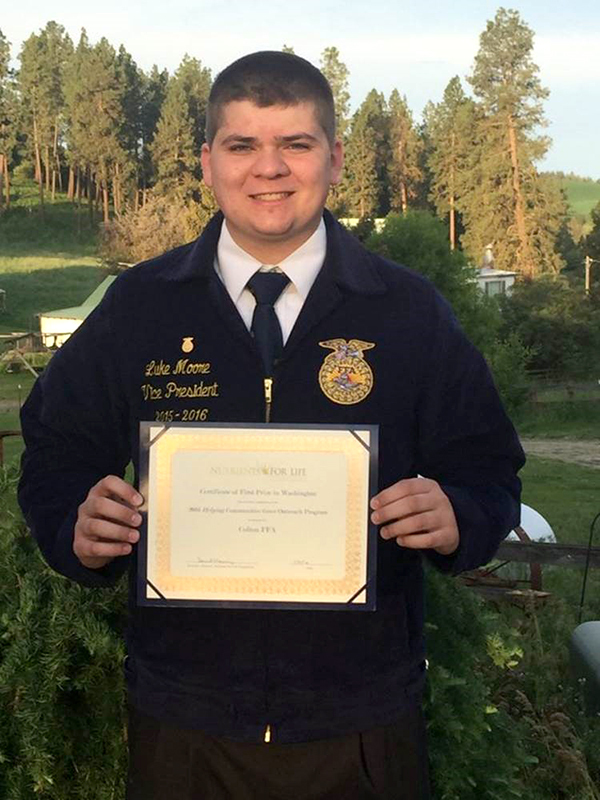 FFA chapters are active all year round – follow along with the chapters who provided links to their social media accounts to us!